Michael Stoskopf was still a student at Colorado State University when he attended his first American Association of Zoo Veterinarians meeting in Atlanta. And now, 42 years later, Stoskopf returned to the city this summer to accept the AAZV’s Lifetime Achievement Award. The professor of aquatics, wildlife and zoological medicine at the North Carolina State University College of Veterinary Medicine (CVM) fittingly accepted the award under the gaze of whale sharks, manta rays and beluga whales gliding about in the main hall of the Georgia Aquarium. In his acceptance speech, Stoskopf repeatedly recognized the influence of several mentors, stating that he could not think of a “single important achievement” in his life that he could claim to have done on his own. He discussed the growth of his field and how lucky he has felt to be a part of it. And he profusely thanked his wife and “true soul mate” Susanne Kennedy-Stoskopf, a fellow CVM research professor in aquatics, wildlife and zoo medicine. Stoskopf says he was the sole student with an interest in zoological health while completing his DVM at Colorado State University. Afterward, he was a veterinarian at the Overton Park Zoo and Aquarium (now Memphis Zoo and Aquarium) and then moved to clinical duties at the Maryland Zoo in Baltimore while as a faculty member at Johns Hopkins University. He was the first chief of medicine at the National Aquarium in Baltimore and during that time earned a Ph.D. in environmental and biochemical toxicology from Johns Hopkins. Stoskopf was vitally active in establishing the American College of Zoological Medicine, at one time serving as president of the then-fledgling organization. In 1989, Stoskopf left a tenured position at the Johns Hopkins University School of Medicine to come to NC State as the head of the Companion Animal and Special Species department, now known as the Department of Clinical Sciences, where he remains today. As the director of NC State’s Environmental Medicine Consortium, Stoskopf is active in various wildlife and marine science programs, teaching an extensive variety of DVM courses at the CVM. 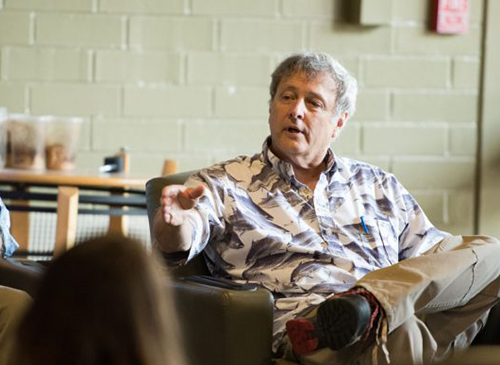 A large portion of his work now relates to ecological global changes, conservation strategies and animal health management, including reintroducing several endangered species to the wild, such as the red wolf. In his acceptance speech, Stoskopf touched on the ever-pressing goal of improving the health of the planet for all animals. “The truth is, our purpose, to make the world a better place for wildlife, is one of such importance and scale that it needs to be served by the lifetime achievements of a small army and over a much longer period than a single lifetime,” he said. But he is optimistic for the future. After all, more than four decades ago, he was guided along by inspiring colleagues in his field. For Stoskopf, one his biggest lifetime achievements was looking out at the crowd in Atlanta and seeing those who may have been inspired by his work.